It's the bane of the business traveler: having to wait in long airport lines to get through security or customs. There are programs that can speed you past those snaking lines, but finding one that's worth the money depends on where, how often and which airlines you fly. Three of the most popular options are TSA PreCheck, Global Entry, and CLEAR. Here's how to tell which may be right for you. You're running late for a flight, plotting your sprint to the gate, and suddenly you see a big crowd of people waiting to go through the scanners. Rather than beg your fellow passengers to let you cut in front, if you have TSA Precheck, you can usually skirt the line and speed through security. To sign up, pre-register online, then make an appointment for an interview at an application center. Or, go to a center and complete the entire process there. Make sure to bring along your passport, immigration documents, or drivers license and birth certificate. Once vetted, you should hear back from TSA after about two weeks. Assuming you're declared "low-risk," you'll receive a known traveler number (KTN) -- your magic ticket for expedited security on domestic or international flights at more than 150 airports nationwide. About 1.5 million travelers are currently enrolled. Participating airlines include Air Canada, Alaska Airlines, American Airlines, Delta Air Lines, Hawaiian Airlines, JetBlue Airways, OneJet, Southwest AIrlines, Sun Country, United Airlines, US Airways and Virgin America. For $85 and a background check, you can travel hassle-free for 5 years. But if you do a lot of international travel, you'll probably want to shell out a bit more for the extra perks that come with Global Entry. On your way back home after a long international flight, the last thing you want to do is spend hours shuffling through the customs line. If you're a member of Global Entry, you'll skip that line. Just scan your passport and fingerprints at a customs kiosk after you arrive at any of 59 participating airports. Your photo will be taken, and assuming everything matches up, you'll get a receipt and you're done. You'll beat everyone to baggage claim! To sign up, just create an account, fill out a form online and pay a $100 nonrefundable application fee. If you're conditionally approved, you can log back into your account after 7 to 10 days to schedule an interview at your one of the 90 enrollment centers nationwide, many of which are located at airports. One downside: the wait. Because of the large number of applications, it can take months to get an interview slot. And if you don't live close to an enrollment center, scheduling can get even trickier: You'll either have to make a separate trip or try to plan it around an upcoming flight. To get Global Entry, you'll likely be asked why you want it and whether you have a criminal history or past issues with customs and immigration, according to the U.S. Customs and Border Protection's website. Your fingerprints will be scanned, and your photo taken. There are currently 2.4 million people enrolled in Global Entry. Assuming you're approved, the perks are notable. Besides speeding through customs, you'll also get an express pass through security for five years, since TSA Precheck is included as part of your membership. And some credit cards, like Amex Platinum and Citi Prestige, will reimburse the application fee. Jason Rabinowitz, who frequently travels abroad for vacations and as a data research manager with RouteHappy.com, a firm that provides data on flights' comfort, entertainment and other soft factors, calls Global Entry a "must-have for road warriors." The first time Rabinowitz used it, on a trip back from Mexico City, customs lines at JFK Airport had gotten so long, they weren't letting passengers off the flight. But they made an exception for Global Entry members, so Rabinowitz was able to exit immediately, saving him almost 3 hours. "I paid that $100 and never looked back again," he said. CLEAR addresses a bottleneck that often crops up before you get to the TSA's metal detectors and body scanners -- namely, the security line where your ID is checked. Instead of waiting for an officer to review your documents, CLEAR lets you skip straight to a special lane to scan your boarding pass and fingerprint or iris. A team member will then guide you directly to the security line -- all in less than five minutes, according to the company. And if you're a member of TSA Precheck, you can skip the screening line after that, too. One caveat: The program is only available at 13 airports: Austin, Baltimore, Dallas, Denver, Houston (George Bush and William Hobby), Las Vegas, Miami, Orlando, San Antonio, San Francisco, San Jose, and Westchester County. You can enroll at any of those airports -- fast. Just complete an online application and head straight to one of CLEAR's enrollment centers where your identity will be verified, fingerprints captured, and iris scanned. Unlike TSA Precheck and Global Entry, where there's often a wait for approval, you can start using the program immediately, says CLEAR president Ken Cornick. And it works for any airline flying from those places. On the other hand, CLEAR is also significantly pricier -- $179 a year. That's more than 10 times the annual cost of TSA Precheck or Global Entry (although you have to pay for five years of membership with those programs). At least children under 18 can be added to your membership for free. Adult family members are $50 more apiece. Better yet, your company might pick up the tab for your membership -- CLEAR offers special corporate rates. The service currently has almost 500,000 users. 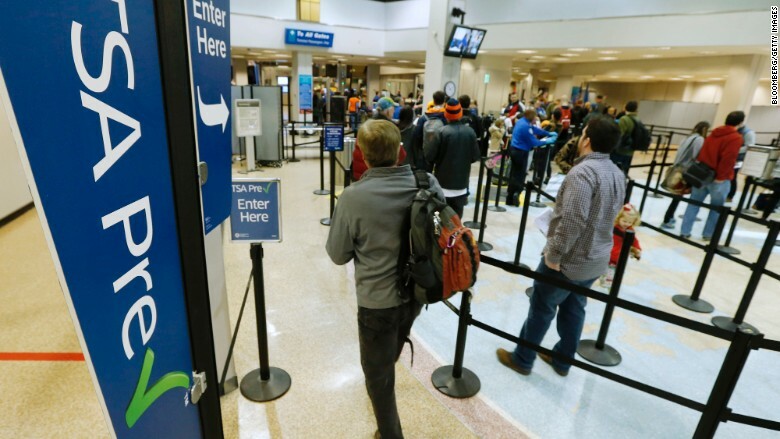 And, says Cornick, CLEAR can be a great add-on if you're already in TSA Precheck or Global Entry, speeding you through the airport even more quickly. Nicholas Mirante, 27, a business development manager at BrightStar Care, a healthcare services firm, travels over 130,000 miles a year for business and pleasure from his home in San Francisco. He's a member of all three services, and says what used to take 30 minutes to get past TSA checks has been cut to under one minute. CLEAR has been a big help with that, he says. "It's better by leaps and bounds," says Mirante. "I don't know what I was doing without it."